Submitted by Jules on Wed, 08/08/2012 - 06:09. Submitted by Jules on Sun, 31/01/2010 - 10:59. Want regular weather and other updates in your email? Then join our online community by putting your first name and email address into the box to your left. Submitted by Jules on Thu, 28/01/2010 - 08:23. Submitted by Jules on Mon, 07/09/2009 - 12:16. 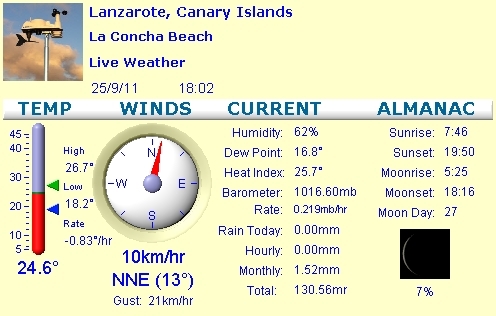 This live weather report is brought to you by a private weather station situated at La Concha (in between Playa Honda and Arrecife) and courtesy of Lanzarote Webcam. What's The Weather Like In March In Lanzarote? Submitted by Miguel on Wed, 05/04/2017 - 13:28. Here’s our summary of the March weather in Lanzarote, based on recording the actual weather here on the island since 2008. The sun rises at around 7AM in March and sets at around 7PM, although everything shifts an hour forward towards the end of the month when the clocks change, so the evenings stay lighter. longer. Why Does Lanzarote Suffer So Much When It Rains? Submitted by Miguel on Thu, 27/10/2016 - 15:01. Lanzarote Weather - Rain Next Week? Submitted by Miguel on Thu, 20/10/2016 - 15:01. A few people have been asking us about next week’s weather, so we’ve done some digging to find out what the score is for you. Submitted by Jules on Thu, 01/09/2016 - 16:24. Lanzarote was the hottest place in Spain on the 6th August 2016, with a temperature of 42.4 degrees (108F) recorded at the airport at 1700 hours.